Children play in front of the field at Cidade de Deus (City of God) slum in Rio de Janeiro March 15, 2011, where U.S. President Barrack Obama will visit on Sunday, according to the local press (Ricardo Moraes/Courtesy Reuters). I got the chance last week to visit the Centro Comunitário Lídia dos Santos (or CEACA), an NGO based in the Rio de Janeiro favela of Morro dos Macacos—once the grounds of a zoo, and now home to some 25,000 cariocas (Rio’s residents). Headed by Dona Anna Marcondes Faria, it is the culmination of nearly fifty years of her work to make the community safer. From initial efforts to bring running water and kindergarten classes to the neighborhood, the two story building now offers a host of after school programs, art classes, professional training sessions, and environmental awareness projects. The goal is not just to teach skills but also confidence. CEACA, along with NGOs in some 450 other communities, have gained the attention and support of Coca-Cola, McDonalds, Walmart, and dozens of other corporations. A recurring theme in the conversations we had with our hosts and guides was change. Visiting the community’s recycling building, the manager Dona Regina da Silva spoke to us about the challenge of gaining residents’ support for the business. In the beginning she worked alone, snubbed by many of her neighbors as the “garbage lady.” Today, some 700 families bring bottles, paper, plastics, and other goods each week to exchange for food tokens, and in the building next door women and youths use the sorted neighborhood trash materials to create beautiful items such as pillows, bags, and placemats (you can see their work here). In the computer lab/classroom, we spoke with a group of teenagers. Asked what they wanted to be when they grew up, the students offered up careers including engineers, architects, and biologists. Our guides said that this was a significant shift from just a few years ago—when the dreams were smaller and the enthusiasm less pervasive. One of the teachers that spoke with us was a past student, back to help the younger generation as she finished up her university degree. Though she said that few of her former classmates had followed her into higher education, they all dreamed of it, another big change from the past. Organizations such as CEARA make a difference by connecting individuals within the neighborhood and preparing them for the broader world. Also important in transforming the futures of Macacos’ residents has been Rio’s broader security efforts. On the streets the blue and black uniforms of Pacifying Police Unit (UPP) troops were noticeable, part of a city-wide effort (now in over twenty neighborhoods) to introduce a permanent police presence into historically gang-run areas. Many Morro dos Macacos residents recounted the isolation they felt before the UPP officers arrived. 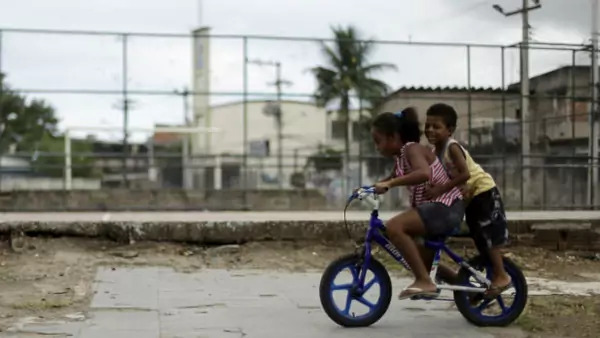 Not only did they face discrimination from those on the outside when they revealed where they lived, they also found it dangerous to simply come and go, as rivalries between the gangs controlling each favela extended to all residents—whether members or not . Now with the UPP in place, residents can travel more freely. With persistent high inequality and poverty rates, and over a million living in Rio’s favelas alone, these individual steps may be small. But from my few hours there, the Morro dos Macacos neighborhood at least felt to be moving in the right direction.